Pretty sure this has been a tough topic (VST) to follow along with as we have been all over the map. We are learning a ton and still have ton to learn. We get so excited when we get something figured out we want to share it with everyone and put up a post without tying all the pieces together. Bare with us. Once we get just a little smarter (or would that be dangerous?) we will try to circle back and put everything in a nice logical order that you can follow along with. Who knows, we might even try to do a couple of videos in hopes it will make more sense to everyone. We have moved past our initial issue that caused OAX to crash when Kontakt was loaded. We started with just one sound assigned to MIDI channel 1 and we were able to play sounds from the upper keyboard. We are now up to the point of having multiple sounds playing on separate MIDI channels and a couple of “User Sounds” set up in OAX to allow that to happen. If you followed along when we setup our Roland Integra7 with OAX we mentioned a naming convention for user sounds. In that case, since we were working with a Roland device, we started the name of each (OAX User) sound with “R”. Following the same logic we started the names of our test sounds in Kontakt with a “K”. Below you can see we have three “K” sounds registered. One on Upper1, Lower1 and Pedal1. At this point we need to spend some time working with Kontakt and understand the various options it provides for mapping sounds and think about how we will setup not only Kontakt, but the OAX side of things. Win 10 has advanced monitoring tools on-board, as do most VSTs (Including the ability to choose the amount of cores to use etc.) most also allow you to disable features if the CPU starts to overload. Win 10 still has the Win 7 imaging program built in, so you can create an image of the drive without needing to use separate software. USB 3 is as fast as SATA 3 so you can quite easily run Win 10 and OAX off an external SSD drive if you wanted, (It’s actually built into Win 10 to allow you to do this) so no real need to open it up. Most VSTs have txt or ini files available which most programs can read and they can be used to automatically set up the VST. (Not as yet implemented by Wersi as far as I am aware) What OAX really needs is something like NI’s Native Kontrol Software. Don’t worry about getting a second PC yet, as I can assure you that apart from memory, Jeff’s rig will run out of resources long before the Sonic hardware will. Always remember to have fun. Chris, you are absolutely right, libraries like Albion One demand a high level of computing power. These are proper man’s libraries, libraries that haven’t shaved for over a week. This is the reason why I made the provision of adequate computing power one of the criteria in the ‘VST Reference Standard’ that I posted to Curt a little while ago. We have yet to ascertain whether the Sonic PC can handle this sort of demand. On the subject of MIDI channels, on OAS it’s straightforward. The MIDI channel is fixed to the layer, not the sound, so we can place a Kontakt sound on any or all of the layers. 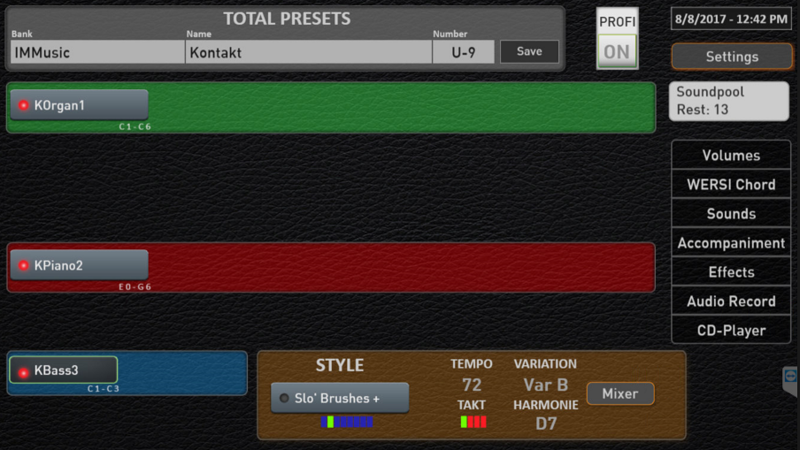 We simply place an Instrument Bank in the Kontakt Multi for each MIDI channel we wish to use. The Upgrade Manual shows how this is accomplished. On OAX we appear to have two options. We can ‘hard code’ the MIDI channel to the sound. The problem here is that to achieve the same level of flexibility we would need to create up to 16 versions of the same sound, one for each MIDI channel. This is very inefficient and we’re going to quickly run out of Program Change codes for the sounds. The other option would be to allow the OAX to dynamically allocate the MIDI channels for the Kontakt sounds, and then have an Instrument Bank set up in the Multi for each channel. Of course, each Instrument Bank would have to be identical, which is not a restriction we have with OAS. I have different Instrument Banks defined for the pedal channels with just the pedal sounds entered. I think however that this dynamic allocation may work better. It’s worth a try. I have been lurking looking at progress on your VST adventures, and looks like you have pretty much cracked it. I think a tutorial as Ross suggested would be really useful in order to prevent us all “bricking” OAX, but quite excited at the possibility of Kontact and its library of sounds being available. Might also be useful to ask Wersi to integrate / pre-install Kontact into OAX, after all I think the player is free anyway, and from a NI perspective, it is just opening up the number of people that may buy their sound and effect libraries. Looking at Jeff’s point about knowing whether the Sonic can cope with this, have you thought about using Perfmon to see what effect Kontact is having on system resources, and what load it places when loading sounds. I know that i7’s have 8 virtual processors, so would be interesting to see whether OAX and Kontact single or multi-thread and to what degree, and how much memory they are taking, as if they start to get close to the limit, Windows will start paging to disk, which will have an exponential detrimental effect to performance. Also interesting to see number of IOPS each workload is doing, and how close to the ceiling of SSD performance it is getting. I haven’t done any performance analysis work on SSD based systems, as they weren’t really around when I was doing this in a commercial environment, however there must be a principle of access density, where a single interface can only handle so many I/O’s per second. When I had OAS, I had opened the organ up and cloned the main disk for security and installed a couple of 7200 RPM SATA drives, which made the system very responsive. I put the pagefile.sys on the second drive and a few other bits, as Windows XP was only 32bit, and this couldn’t address more than 4gb, this minimising paging impact on the system, as typically the pagefile.sys is either non- contiguous, or the head has to move so far that you get RPS (Rotate, Position, Seek) misses. Feels like there might be a good case for putting a second SSD into the Sonic, and putting the pagefile.sys on it and loading VST’s, such that the risk of VST’s and OAX interfering with basic Windows operation. I haven’t done anything with VMWare, so no experience with its latency, however reminds me of an IBM event quite a number of years ago, where they showed Windows 3 running natively and then alongside OS/2 running Windows 3.1, identical hardware, and at that time Windows ran quicker under OS/2 rather than native, although that didn’t have the ability to move workloads on the fly, which our IT guys do with VWWare. Great to hear from you! Not sure if we have it “cracked” just yet but I think we are to the point of making it a useable & playable option. I’m just getting started on a video series that hopefully will help. I’d like to keep each of the videos to 6-8 minutes in length to keep people interested in watching. It’s a complex subject so it might take a couple of them to get all of us on the same page. (Along with the fact that I tend to “babble”)! I hope to have video “1” out sometime in the next few days and we will go from there. Funny you mentioned perfmon. I did think about that but more along the lines of what happens if we load up multiple VST’s (Kontakt plus something else like Hauptwerk)? I’ll get us all to that point and welcome expert input from you and others on what we all would like to measure and the best way to accomplish that. At this point we have only been working with the simple samples that you can download for free from Native Instruments. Related to that we just purchased “Session Horns Pro” from NI (as in two hours ago). We are using that sample set outside of OAX on a DAW setup with Kontakt and you can quickly see the difference in load times and the amount of memory those samples take. (Killer sounds by the way!) We will get some audio demos uploaded soon so folks can take a listen / compare and make their own decision on what all the fuss is about. We are now getting into the whole reason to look at Konkat or other VST’s running on OAX – I’ll just say – Cause the sound samples are “simply better”. No offense to the “Factory OAX” sounds but we are no longer comparing apples to apples. I 100 % agree with you it and it might be time ( It is! ) for us to start looking at a second SSD for our Sonic and also maxing out the memory on the internal PC. The addition of a second SSD will be needed not only for basic storage needs of the various sample libraries but also to help separate workloads across multiple devices. Of course, at some point we will get limited by the shared interface for those devices. We can only physically change so much. This is where Jeff should be chiming in and reminding us all about running on a “second processor” – 🙂 🙂 Actually, it is 100% a fair point of view and the path I had expected to follow when I started. Said another way – it is technically a better solution and allows for expansion opportunities far outside of the internal PC of the Sonic. In my case, I was not able to find a solution that passed not only the “Wife & Curt – It looks OK” when folks walk into the house test, but ergonomically, it just wasn’t working for me. Sitting at the console of the instrument using the various buttons, knobs and touch-screen of the Sonic to control it all… Well, that works nicely. The PC setup I had in place was to hard to reach and interact with and I found I wasn’t using it. This configuration, so far, is working better for us. Having said that – The possibility of sitting at an OAX instrument and using it as a controller for various VST’s along what is already “included” in OAX – mixing and matching all of that together as needed – EXCITING! Thinking about putting together a video on where we are to help folks get a better idea of what’s going on. I’m a little spoiled by doing some work with Kontakt running in a Cakewalk Sonar environment and as you mentioned, the config of everything is saved as part of the Sonar project. In this case – on the Kontakt side we only have “omni” and 4 MIDI ports (A-D). Only port “A” shows available although you can pick any channel you want. On the OAX side it defaults to an automatic channel selection or you can hard-code a channel for each “VST-Sound”. I need to go back and review what Jeff posted and how he implemented. Slightly different with OAS and of course he is hosting Kontakt on a Mac but interested in his thoughts. I would be very interested if you were able to do a video on in corporating Kontakt in to OAX. At present I can run Kontakt with Albion One on a standalone PC connected to the Sonic, but suffer with a fairly high degree of latency (probably due to the relative low spec of the PC which was originally intended to display sheet music). The other issue I found was that I could only assign 1 external (midi channel/sound) per manual so will be interested to see how you solve that. Hey Chris – I’ll pass this along. There is zero latency when running Kontakt directly on the Sonic. Responds exactly the same as an “OAX Sound”. I do have a configuration in place that allows for more that one Kontakt sound to be assigned to the upper manual. Just tried it. All ties back to the comments Bill and I have had going back-n-forth on MIDI channels. What we really need is what Bill referred to as a “Multi MIDI” option in Kontakt when running in OAX. Without that it takes a little more thought in how you plan to use the sounds and which “Sound Selector” on OAX you want to use for them. (Upper1/2/3.. / Lower 1, etc.). Sitting here right now thinking about the best way to capture some of this whole discussion as it should make more sense in video format. cost a lot of $$$$, so why are they not complete? It makes it harder to purchase. I would agree with Bill’s comment Jerry. Perhaps it’s “point of view”? Look at it the other way. Isn’t it interesting that Wersi provides an interface to allow us to connect in 3rd party software / sounds? I would also agree with you – It’s not for the faint of heart but the sound libraries that are on the market are simply amazing. When you load Kontakt into the OAX Host, choose the 128 option as this will automatically assign the appropriate program change numbers (1 – 128) for you, (At least it should if it’s working correctly) which is what is needed to change sounds in Kontakt. Touch the spanner symbol to expand the bank, then drag the sounds you want from your selection on the left to the slots in the instruments bank, (For convenience I suggest you drag them into the slots sequentially) when completed touch the floppy button again and choose save Multi As, then type the name of your choice and save. Make sure you have plenty of Real Ale available. Yep – That works great Bill. I’m poking through the manual right now but let me ask as you might already know the answer. Once we have saved a “multi” can it be called up via a program or back change? What I’ve found so far is that when you start up Kontakt there are not any sounds loaded so the user sounds on the OAX side do nothing… Until I load up the multi saved as you mentioned above. The other piece to work out is the best way to map MIDI channels to make it easy to assign a sound anywhere. Thoughts? KONTAKT will load at startup or when you choose the Reset Multi command. Yep – That works. We have the VST preset we called Kontakt setup to load when OAX starts and by saving a “default multi” the various sounds in that multi are available. Next is to think about options on using MIDI channels.